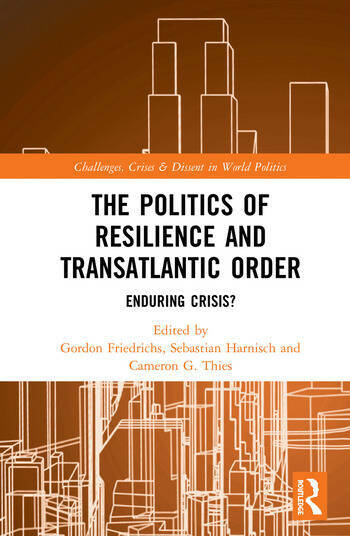 The Politics of Resilience and Transatlantic Order: Enduring Crisis? This edited volume bridges the "analytical divide" between studies of transatlantic relations, democratic peace theory, and foreign policy analysis and improves our theoretical understanding of the logic of crises prevention and resolution. The recent rise of populism and polarization in both the US and Europe add to a host of foreign policy crises that have emerged in transatlantic relations over the last two decades. Through examining how democracies can manage to sustain and maintain mechanisms of crisis resilience that are embedded in the democratic peace, and particularly transatlantic relations, this book helps enhance the understanding of inter-democratic crisis resolution across issue areas. In doing so, it addresses some of the most important and prevalent crises of our time, such as anti-terrorism intervention in Afghanistan, Iran’s nuclear program, burden-sharing within NATO, key aspects of the international order such as binding norms for cyber security and the integration of China into the Western-led international economic order, as well as domestic order shifts such as the British vote to leave the EU and the impact of the Trump administration populist foreign policy on transatlantic crisis resolution. This book will be of key interest to students and scholars of International Relations, Transatlantic Studies, Foreign Policy Analysis and Comparative Politics. Gordon Friedrichs is Research Associate at the Department of International Relations and Foreign Policy, Heidelberg University, Germany. Sebastian Harnisch is Professor at the Department of International Relations and Foreign Policy, Heidelberg University, Germany. Cameron G. Thies is Professor and Director of the School of Politics and Global Studies at Arizona State University, USA.